Mac Faulkner posted an incredibly moving video on The Chive website on November 10, 2011. 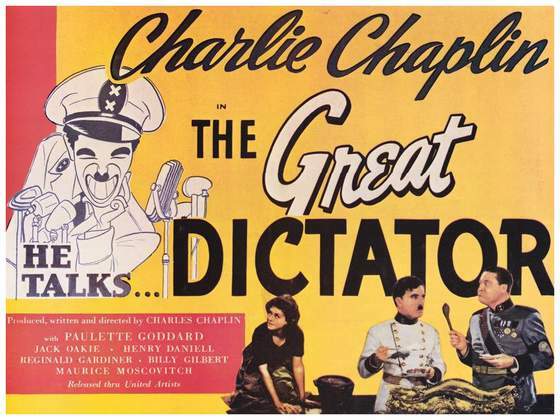 In Charlie Chaplin’s film The Great Dictator (1940), Chaplin plays a poor Jewish barber that is mistaken for Adolf Hitler. The film ends with what many critics regard as one of the greatest speeches of all time. I have to agree with the critics, as I have watched this video more than a few times already. The full text of the speech has been transcribed below the video. I’m sorry, but I don’t want to be an emperor. That’s not my business. I don’t want to rule or conquer anyone. I should like to help everyone if possible; Jew, Gentile, black man, white. We all want to help one another. Human beings are like that. We want to live by each other’s happiness, not by each other’s misery. We don’t want to hate and despise one another. In this world there is room for everyone, and the good earth is rich and can provide for everyone. The way of life can be free and beautiful, but we have lost the way. Greed has poisoned men’s souls, has barricaded the world with hate, has goose-stepped us into misery and bloodshed. We have developed speed, but we have shut ourselves in. Machinery that gives abundance has left us in want. Our knowledge has made us cynical; our cleverness, hard and unkind. We think too much and feel too little. More than machinery, we need humanity. More than cleverness, we need kindness and gentleness. Without these qualities, life will be violent and all will be lost. The airplane and the radio have brought us closer together. The very nature of these inventions cries out for the goodness in men; cries out for universal brotherhood; for the unity of us all. Even now my voice is reaching millions throughout the world, millions of despairing men, women, and little children, victims of a system that makes men torture and imprison innocent people. To those who can hear me, I say, do not despair. The misery that is now upon us is but the passing of greed, the bitterness of men who fear the way of human progress. The hate of men will pass, and dictators die, and the power they took from the people will return to the people. And so long as men die, liberty will never perish. Soldiers! Don’t give yourselves to brutes, men who despise you, enslave you; who regiment your lives, tell you what to do, what to think and what to feel! Who drill you, diet you, treat you like cattle, use you as cannon fodder. Don’t give yourselves to these unnatural men – machine men with machine minds and machine hearts! You are not machines, you are not cattle, you are men! You have the love of humanity in your hearts! You don’t hate! Only the unloved hate; the unloved and the unnatural. Soldiers! Don’t fight for slavery! Fight for liberty! In the seventeenth chapter of St. Luke, it is written that the kingdom of God is within man, not one man nor a group of men, but in all men! In you! You, the people, have the power, the power to create machines, the power to create happiness! You, the people, have the power to make this life free and beautiful, to make this life a wonderful adventure. Then in the name of democracy, let us use that power. Let us all unite. Let us fight for a new world, a decent world that will give men a chance to work, that will give youth a future and old age a security. By the promise of these things, brutes have risen to power. But they lie! They do not fulfill that promise. They never will! Dictators free themselves but they enslave the people. Now let us fight to fulfill that promise. Let us fight to free the world! To do away with national barriers! To do away with greed, with hate and intolerance! Let us fight for a world of reason, a world where science and progress will lead to all men’s happiness. Keep up the good work Patrick. we got where we are today by following the science and progress model. Change thats worth it (occupy) will bring us back in tune with earth. Why the climbing, where are we trying to get? Yeah I know the feeling, I’ve watched this at least once every day since I first saw it. Its a Great Dictator Speech! I will put it on my Facebook! Do not vote for any political/religious party of any Government in all the World, to make them realize that, PEOPLE still have POWER.